In Japanese “okonomi” means “as you like it”, so the idea is to put whatever tickles your fancy into this savoury Japanese pancake or okonomiyaki. 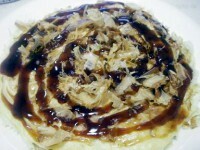 Often sold at outdoor stalls during festivals, okonomiyaki is to be eaten without pretension. Beat a few eggs, some sifted plain flour and dashi stock to make batter. To make a fluffier batter, we use grated yam, which you can get in some Japanese stores frozen, but you can always use a little extra egg white for the same effect. (You can also use water instead of dashi, but then, it’s not as nice.) The batter should be like a slightly watery pancake batter texture. Add to the batter your “okonomi” ingredients. Most okonomiyaki have cabbage (chopped finely, but don’t chop too finely as it gets watery and ruins the texture of the pancake), chopped shallots, calamari, tenkasu (leftover crunchy fried dough from making tempura), some dried shrimp and red pickled ginger. But remember that you can add whatever you want, and often we make ours with leftovers from the fridge. Cook well both sides in a frying pan or on the barbecue or teppanyaki plate. Should be crispy and a little burnt on the outside. Make sure the batter is cooked inside as it is a very thick pancake. If you are adding meat, best to cook it a little beforehand. To serve, cover with soy sauce, Bulldog Tonkatsu sauce, worcestershire sauce and some mayonnaise if you want. Sprinkle with some nori or bonito flakes for extra texture and added flavour.